The County Squad for the preliminary knockout match against Surrey in the ESMBA inter county series is shown below. 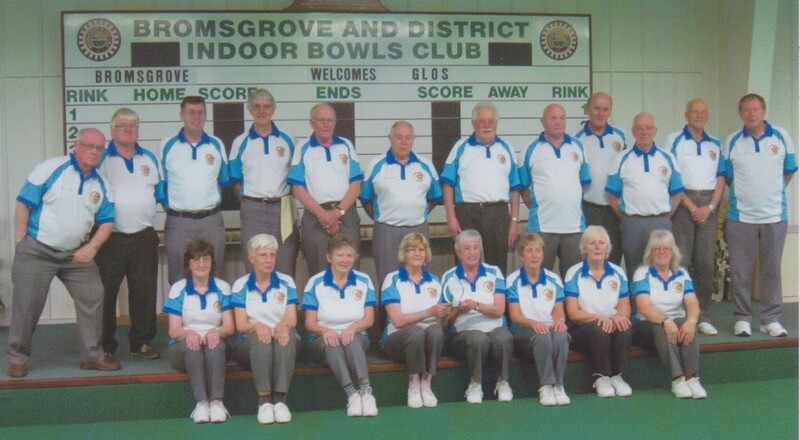 The match is being played at the Daventry Indoor Bowls club on the 31st January 2016 and players are requested to be at Daventry no later than 10.00am. 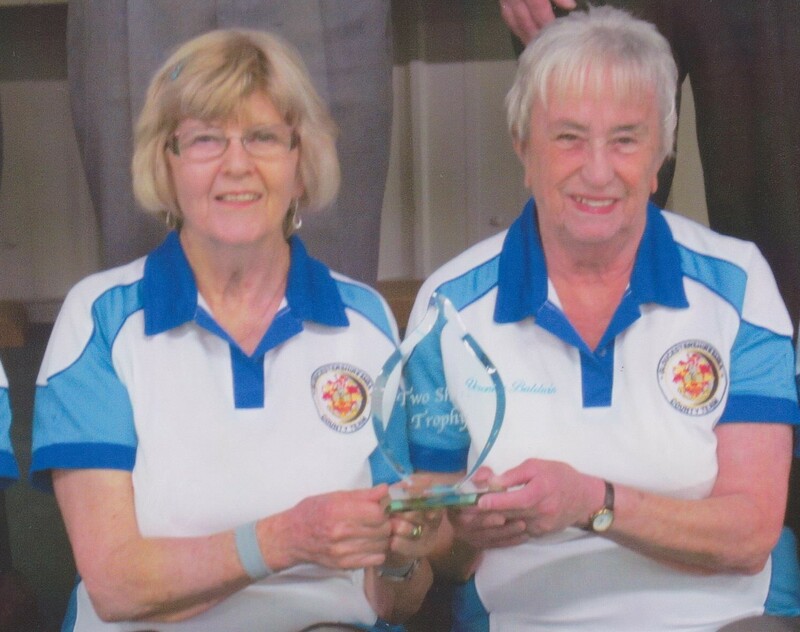 At the Mixed fours on Saturday 2nd January we learned of the shocking news that one of our fellow bowlers – Steve Tyler – had recently passed away. Steve was very keen to play bowls for his league team at Gilt Edge and the County short mat team. It was a pleasure to know him and to have played along side him and he will be sadly missed by one and all. Rest in peace a gentleman and friend – Your Captain Richard Payne. All entrants in the County Fours Competition are advised that the date of the competition has been changed from the 30th January to the 23rd January 2016. Time – 9.00am to 2.00pm. 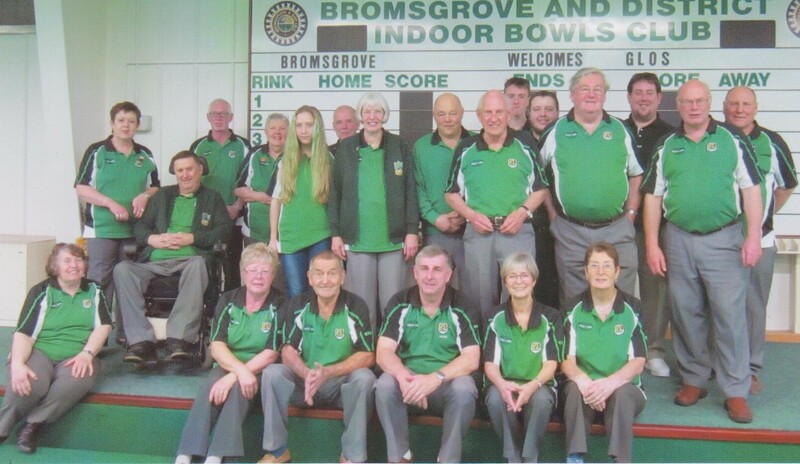 The County hosted Gloucestershire “A” at Bromsgrove on the 19th December in this friendly fixture to determine the inaugural winner of the Two Shires Trophy. – the first leg was at Churchdown in September. The trophy, pictured below after presentation to the Gloucestershire squad, was donated by the County Captain of the Worcestershire Squad, Richard Payne, and will be competed for on an annual basis. The County lost this second leg match by 10 points to 30 resulting in an overall win for Gloucestershire by 58 points to 22. The second leg shots tally was 156 for Worcestershire and 224 for Gloucestershire. Worcestershire were disappointed by the scale of this defeat even if it was against a strong Gloucestershire squad. Notable successes in the morning session for Worcestershire were Jim Tingle’s 18-9 win in the Singles, Richard Dank’s Fours team ( including Carole Arnold, Margaret Powell, and Tony Crowley ) winning by 10 shots to 8, and Terry Clifford’s Fours team ( including Jenny Gibbs, Ann Hough, and Ben Mol ) who won comfortably by 18 shots to 4. In the afternoon session the only county win was by Terry Clifford’s Fours team ( again ) who won by 9 shots to 5. After the match the Two Shires Trophy was presented to the Gloucestershire squad and photographs of both squads were taken to mark this inaugural event. Both Counties look forward to next season’s competition with Worcestershire seeking to achieve a different outcome. The county visited Shropshire for this last inter county match of the season with a win necessary to qualify for the national inter county knockout competition starting at the end of January next year. The county won by 24 points to 16, scoring 199 shots to Shropshire’s 184. As a result Worcestershire go forward to next year’s knockout competition. The first session – Singles – Jim had a close match until the last few ends but Steve was outclassed. In the Pairs Anthony and Johnathon just lost out with Trish and Richard battling a tight see-saw game to 8 – 8, when they came to terms with the mat to pull away and when convincingly 18 – 8. 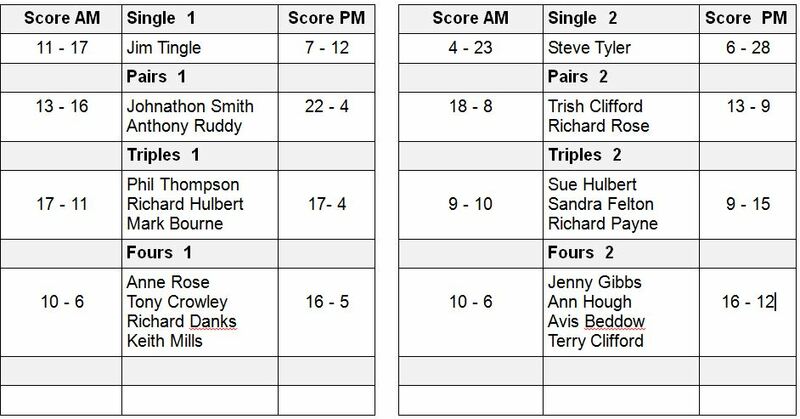 The Triple of Phil, Richard and Mark, swept the opposition away to win 17 – 11, while Sue, Sandra and Richard were unlucky to lose on the last end. The Fours of Anne, Tony, Richard and Keith piled on the pressure to win by 10 shots to 6, as did Jenny, Ann, Avis and Terry. The county started the afternoon session with confidence. Both Singles, however, lost, but both Pairs won. Johnathon and Anthony smashed their way to a 22 – 4 victory ( highest score of the season ).The Triples of Phil, Richard and Mark also won easily, but unfortunately Sue, Sandra and Richard faded over the last few ends to a loss. The Fours also were in fine fettle winning easily.